Shopping for the best infrared sauna can be a hard endeavor. At first glance, all infrared sauna models look quite similar, making it hard to choose the best among them. Moreover, over the years, more and more brands of these saunas have been hitting the market. After many days of going through infrared saunas’ sites, you might even get more confused about which model you should pick. We developed this guide and reviews to provide you with straightforward information regarding components and features of infrared saunas. The article will make it easier for you to invest in the ideal infrared sauna for your personal use. 3 How Often To Use Infrared Sauna For Weight Loss? 4 How Do Infrared Saunas Work? 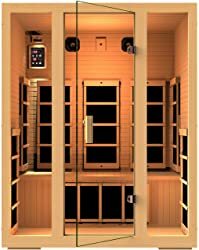 5 How to Clean Infrared Sauna? 6 How Much Does Infrared Sauna Cost? JNH Lifestyles Joyous 2 Person Canadian Hemlock Wood FIR Sauna is one of the best saunas today. This product features double layer 100 percent Canadian Hemlock Wood. Hence, it is a durable sauna that will conserve heat thanks to its construction. Another feature of this infrared sauna is the ease of assembling. With its tongue and grove make, you can easily assemble it by yourself. You don’t need to hire a professional to do it for you and it won’t have any problem after assembling. It is made of FSC certified wood, making it ideal for human use since there is no plywood or chemicals added to its material. And you won’t get bored when inside the sauna as it comes with 2 premium speakers volume rocker, and built-in 3.5mm AUX control. Besides, it comes with durable LED lighting that will always ensure that your sauna is lit. Its digital control panel enables you to control the duration of use and the temperature of the sauna. To provide you with peace of mind, the sauna comes with a 2 years warranty and you will get lifetime tech support. Hence, you can use your infrared sauna without worrying about anything. The market is flooded with JNH Saunas as they are one of the best models on offer, according to different consumer reports. This time we will look at the JNH Lifestyles Joyous 3 Person Canadian Hemlock Wood 8 Carbon Fiber Heater 5 Year Warranty model. As the name suggests, this model comes with a 5 years warranty – that’s a long time for a sauna. Therefore, you can use your sauna without worrying about issues or defects that might arise within that period. It also comes with 8 carbon fiber FIR heaters that provide all the heat that you will require to have a great time in your sauna. To ensure that it is safe for your personal use, this sauna is ETL approved and will always provide the best performance possible. Also, it is UL listed and ETL approved. Just like the JNH Lifestyles Joyous 2 Person, the 3 Person model features double layer Canadian Hemlock T&G timber. Hence, it was built to last and provide the best insulation. Another feature of the product is the 2 Premium Speakers and built-in AUX control that will make your life easier. Digital control that makes it easier for you to control the duration of use and temperature of the sauna is yet another feature that makes it a great product. Built for two individuals, the Radiant Saunas BSA2406 2-Person Deluxe Ceramic Infrared Sauna will provide you with sauna benefits right at your home. This model provides the ideal luxury, with enough space in the interior to enable you to relax comfortably. A built-in audio system comes in handy to provide crystal clear music and sound to keep you entertained when relaxing. The model helps to rejuvenate your body by warming your muscles and joints to relieve pain. Every heater is well-placed to offer constant heat all-over your body. The model is made of Canadian Hemlock construction – hypoallergenic properties and eastern Hemlock’s scar-resistant make it the perfect wood for making saunas. This long-lasting wood is an amazing insulator, retaining the heat contained within the sauna room. With premium features, the model is able to ease the stress of the day and offers a full-spectrum of hue therapy system. The other features of the sauna are the integrated sound system including radio, aux input, and a CD player. The model also offers comfortable backrest, magazine rack, and towel hooks. And if you though a 5-year warranty is long, this model comes with a 7 years warranty. It will cover you for that long. 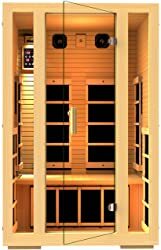 Radiant Saunas 2-Person Hemlock Infrared Sauna with 6 Carbon Heaters is yet another sauna that will make your life more enjoyable. It is full of amazing features, including restorative, an oxygen ionizer, infrared heat, and chromotherapy lighting. Furthermore, the model comes with a premium quality sound system that features aux inputs. You can have a great time while relaxing in your sauna in order to relax the whole body and mind. The model was made to last for years and is made of firm Canadian Hemlock wood that also offers beauty to the sauna. It also comes with a bronze-tinted 8mm glass door which is safe, lasts longer, and reliable. When it comes to assembling, it is an easy process that you can DIY and leave the sauna secure and safe for use. This is possible due to the simple buckle connectors that you are provided for assembling it. It provides steady and even heats from its 6 carbon heaters that are carefully positioned. These heaters offer a maximum of 141 degrees of heat and it is quite easy to adjust the heat. The model comes with a 7-year warranty that covers any defect that might arise due to manufacturer fault. It is a great product that will offer value for your money. LifeSmart Dynamic has been known to provide some of the best saunas that you can get on the market and online today. 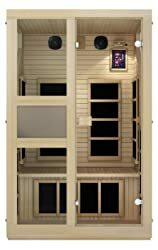 The LifeSmart Dynamic “Alicante” 1-2-Person Bio Ceramic Far Infrared Sauna is one of their most reputable saunas. This model features 4 dynamic bio-ceramic heaters that provide the heat you will require while in your sauna. Three heaters are located at the back while the other one is under the bench. The heaters provide heat of up to 140 degrees F, which is sufficient to keep you relaxed and comfortable while in your sauna. It has sufficient space for holding 1-2-person, which means it isn’t the biggest sauna out there but will do its job well. The model is made of natural reforested Canadian hemlock wood that offers it durability and beauty. 6mm exterior and interior wood planks with a study1.13 inch inner frame. This means that your sauna will have the strength it requires to withstand constant use – all day every day. It also comes with a clear tempered glass door that is safe. One unique feature of this sauna is the side window that makes it even a more attractive sauna and it is the right sauna for Lyme disease. By now you know that JNH products are top-quality and this is true of JNH Lifestyles Joyous 1-Person Canadian Hemlock Wood Far Infrared Sauna. It is a great sauna that will provide you with relaxing your desire with much comfort. It is made of double layer 100 percent Canadian hemlock wood which offers it stability and durability. Besides, this wood is quite attractive, making your sauna a great addition to your home décor. It is very easy to assemble the sauna as it comes with grove and tongue construction. You can easily join the parts to form a useful sauna that will provide you with the service you want. Its wood is FSC certified and has no plywood or chemicals that would make it unsafe for human use. Also, it comes with a built-in volume rocker, 2 premium speakers, and AUX control. Besides, there is LED lighting that makes it a joy to relax in. Another feature of the model is the digital control panel that allows you to control the temperature as well as the duration you stay in your sauna. Although not the longest, the model comes with a 2 years warranty that will offer you peace of mind. 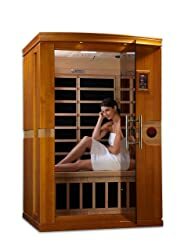 If you are looking for a Far Infrared Sauna that will offer value for your money and be effective, then you need to look at JNH Lifestyles NE2HB1 NE2HB Far Infrared Sauna. This is a great model that was carefully made to offer you with comfort. It is made of double layer 100 percent Canadian hemlock wood that is durable and is able to retain heat. The wood is also quite sturdy and attractive, meaning that it will look nice when in your home. With grove and tongue construction, the sauna is very easy to install. Actually, you don’t need to hire a professional to help you with the installation process. For home, you only need to follow the manufacturer instructions and you will be done within minutes. Its hemlock wood is FSC certified, meaning that it doesn’t contain chemicals or any plywood that can lose heat. Two top-quality speakers, as well as an amplifier and volume rocker, work with different media players that offer Bluetooth ability to provide you with great sound. The sauna also features durable LED lighting that makes it a show when relaxing. It is also quite easy to control the duration of use and temperature, thanks to the digital control panel. The model comes with a three years warranty. The Radiant Sauna BSA2418 4-Person Hemlock Infrared Sauna is made of Canadian hemlock wood. This wood is hypoallergenic and scar-resistant, making it a great wood for making saunas. Furthermore, this wood is an amazing insulator that keeps the heat within your sauna. It features 9 low EMF carbon heaters that are well-positioned to offer a steady curtain of healing warmth. They produce FAR heat that penetrates deep into your body to increase your temperature and relieve joint and muscle pain. The sauna is made for home use and will add the luxurious relation you want in your master bathroom, gym, or basement. Original Canadian hemlock adds to its beauty and complements your home décor. In addition, you will enjoy clear and crisp sound thanks to the built-in audio system. With a color therapy system, you are assured of easing the stresses of everyday hassle and make your life more comfortable. It also comes with integrated sound systems including an input, radio, and CD player. You will also enjoy relaxing backrest, a magazine rack, and towel hooks. There is also a 7 years warranty that will cover all defects that might arise due to unforeseen defaults. Lastly, is the Dynamic Saunas “Venice” 2-Person Low EMF Far Infrared Sauna. This model comes with 6 low EMF FAR infrared carbon heating heaters – 2 on the back, 1 on every side wall, 1 on the floorboard, and 1 below the bench. It has a huge interior that is sufficient for holding 2 adults, meaning that you can have a great time with your loved one inside the sauna. 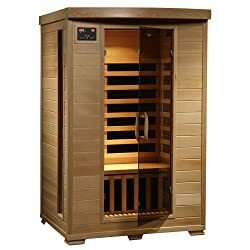 Just like all other great saunas, this model is made of Canadian hemlock wood that makes it a durable and sturdy product. It also comes with a clear tempered glass door that happens to be safe. There are also side windows, making it a unique model compared to most saunas out there. You can also install the sauna by yourself, thanks to its simple construction. Another thing, this is a model that will offer value for your money since it was made to last for years. You can have peace of mind knowing that you have a model that will provide the relaxation you have always wanted. It is a great product for people looking for affordable saunas. An infrared sauna is a sauna that uses infrared heaters to heat the room and warm your body. This type of sauna doesn’t use the traditional “box of hot rocks” or steam as its heating elements. 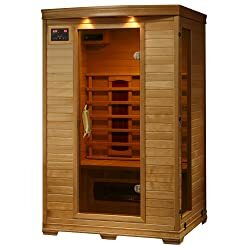 This sauna offers a great environment for using infrared since you get in when naked and there is infrared heat around. How Often To Use Infrared Sauna For Weight Loss? An infrared sauna will result in the user losing weight within a short time. The weight loss occurs due to perspiration. You constantly sweat profusely due to the head in your sauna, so your body will lose a lot of fluid. The fluid loss is what makes you shed some pounds and leave you lighter. Infrared saunas use far infrared technology to provide a relaxing environment you have always wanted. Through the use of this band of light, your body is warmed while the air remains cool. The infrared is a part of something called electromagnetic spectrum and is classified as near, middle, and far. A good example of how infrared saunas work is as follows: imagine it’s a chilly day but the sun is shining. You can feel the air is cold but you feel the warmth when you rest directly in the sun. The sun warms you but it doesn’t warm the air. 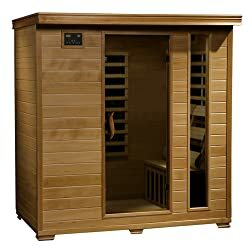 How to Clean Infrared Sauna? Sauna bench – Wipe the bench after every use using a damp cloth and scrub lightly with a hand brush. In case of mold, use a chemical sauna cleaner or a bleach solution. Sauna floor – Use a vacuum cleaner once or twice a week to clean the floor. Also, mop it once per month using a solution. Sauna walls – Use any sauna cleaner to clean the interior walls. Also, treat wood like you would treat any other furniture. The outer part will require more maintenance. Sauna heater – They might require a wipe but they often produce negative ions that keep them in top condition. How Much Does Infrared Sauna Cost? The cost of an infrared sauna will vary depending on the size, brand, quality of construction, the energy rating, and material used. With that said, a 2-person sauna will go for about $1,500-$2,500, a 4-person will go for about $2,000-$4,000, and a 6-person will go for about $6,000-$15,000. Also, you need to factor in optional extras such as sound system ($200-$1,000), air purifier ($150-$250), air ionizer ($150-$250), color light panels ($160-$300 each), custom door ($100-$300), custom interior ($500-$2,000), and aromatherapy dispenser and warmer ($200-$300). The best infrared sauna will offer you with the relaxation you desire after a long day at work. Getting these products is not as hard as you might have thought and there are lots of brands that you can choose from.